A kitchen success, a kitchen failure and my LAST training run! 3 T sesame oil + 1 T red pepper flakes cooked over medium heat for 4 minutes, strain out the red pepper flakes and return the oil to the pan. Add in 4 T of PB2 (prepared per instructions on the jar), 3 T soy sauce and 2 T agave nectar. Stir to combine, adjust as needed. I added another sprinkle of dry PB2 and a squeeze of agave. 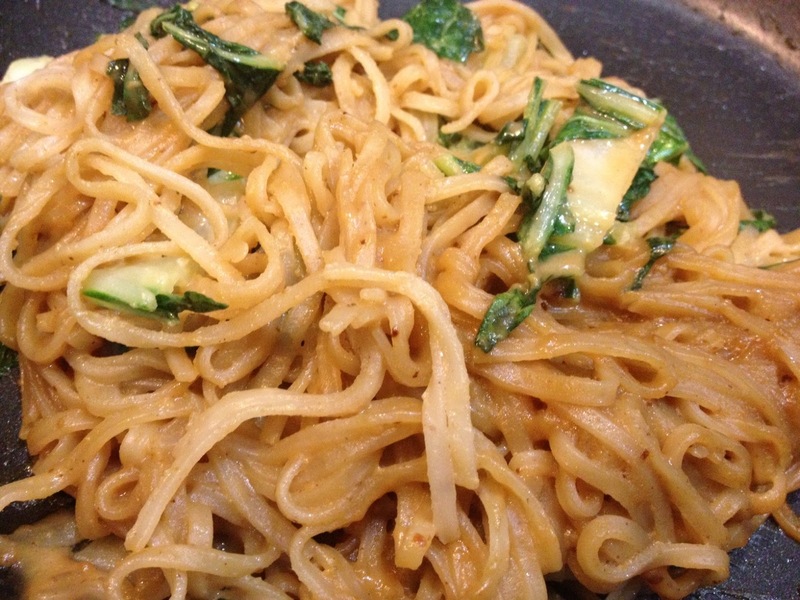 We used brown rice noodles and added in sauteed bok choy. I topped it off with green onions and cilantro. Quick and delicious. This morning was my last training run! My legs were tired but I really just wanted to test out the temperature as the forecast for Saturday is looking a lot like today. According to weather.com it “felt like” 54, so I went with my favorite Moving Comfort shorts and a basic C9 tee. I did an easy two at a ~9ish pace. Admittedly I set out for three but I felt the slightest twinge in my foot so I stopped on the spot, not the time to get hurt! I was a tad chilly in the shade but the sun felt great. Since my race starts about an hour later than my run this morning and will be more than 6 times as long (eek) I think my planned outfit will be just fine. Post run I stretched (which I will be doing a LOT more of over the next 48 hours) and attempted to tweak my favorite Greek yogurt pancakes. The result was a huge giant failure. I was able to salvage about half of the batter and turn it in an edible pancake but it was not delicious. I’m determined to achieve what I was going for and as soon as I do I’ll share the recipe. i have yet to buy PB2. i think i actually saw it at target the other day! do you recommend it? I'm pretty obsessed with PB2. It's got a decent amount of protein (5g per 2T) for way less calories (45 cals!) and fat (1.5g, 0 saturated). I also like that you can easily alter the consistency. Want to drizzle it on pancakes? Just add more water. I still keep regular natural PB in the house (and other nut butters too of course) but I'd say I use PB2 about 75% of the time. Enjoy the taper! You'll feel all kinds of new niggles pop up, but they will heal fine before race day. Congrats on a successful training plan.